In a post this past August, I discussed a relationship I had observed on Twitter that I called the “silent partner”: accounts that follow you but never interact with you, or those who follow you back, but seemingly refuse interaction. I had put forth some proposals on why these connections occur, but I’ve since developed three additional theories on why you may find yourself linked up with a silent partner. First, you may have become trapped in what I call the “follow-back haystack”. If your silent partner follows back everyone who follows them (a custom I find unnecessary), their timeline will become choked with thousands upon thousands of tweeters. Your questions, observations, mentions, and references get lost in the shuffle: the needles in their haystack. Or, to use another analogy, it’s like trying to raise your voice in a crowded restaurant or bar. You’re not silent, and neither is your partner, but they’re dealing with far too much noise to hear you. Some follow-back users are better at getting back to mentions than most, but even then, it may simply be a matter of your post getting viewed a just the right moment. 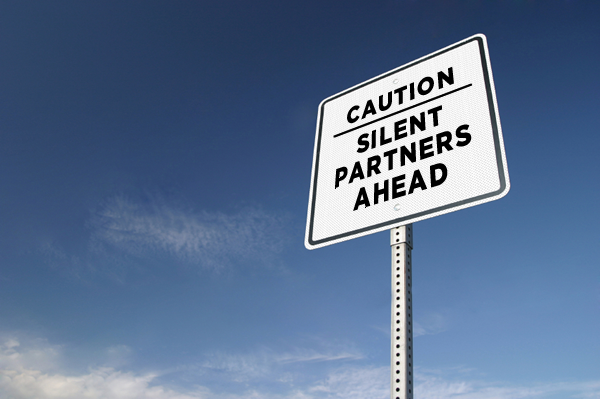 Your silent partner could also be a “list-exclusive conversationalist”: one who only pays attention to those they’ve added to a Twitter list or TweetDeck group. This is especially true if they’re the follow-back type: what better way to cut through all the noise of their timeline then to converse only with a select group of friends, colleagues, and peers? These users may tune back into their timeline now and again, but if you’re not on one of their lists, you may as well be tweeting into the ether. Or, lastly, your silent partner may be an “inattentive idler”: someone who is either sporadically active on Twitter or who dropped off the map altogether. They may have followed you after comments you made in a Twitter chat, or a mention in one of their friend’s timelines. In the meantime, though, they either lost interest or were never really that much into Twitter in the first place. If the idlers only post once every few weeks or months, they’re not likely to spend time scanning back through their timeline’s history to catch up on your posts. Plus, mentions may fall on deaf ears if they’re away for extended periods. I’m sure there are other ways to diagnose the syndrome of “silent partners”. What symptoms have you observed in your travels through the Twitterverse? I’m wondering if they’re only logging in to post a thing here or there to make it look like they’re not a bot, but really only there to measure something like average tweets per hour among a certain demographic? Well, silence can have many reasons – for one, as I am a living creature I have an occasional real life :) There could also be time differences involved. And it’s impossible to comment every tweet of everyone I follow. Sometimes it’s too cumbersome to explain something using only 140 characters. So I welcome your request to comment in your blog.